You are here:Home > What is a Bomboniera? There is a long-standing tradition in Europe of offering a small gift (bomboniera) to each person or each family who are guests at the receptions given for special occasions such as weddings, baptisms and anniversaries. Since the middle ages, sugared almonds (confetti) were used as part of the bomboniera. Tradition holds that confetti are presented to each person (or family) along with a special gift as recognition for their support and good wishes. In addition, bomboniera are sent after the celebration to those who were unable to attend but sent a gift or card. Special, or more significant bomboniere, may be given to family members and friends who have played a special role in the celebrations (bridesmaids, mother(s) of the bride/groom, godparents, flower girls, etc.) The bomboniera serves as both a “thank you” and as a keepsake for many celebrations, including weddings, bridal showers, baby showers, engagement parties, graduations, communions, confirmations, rehearsal dinners, baptisms, anniversaries and birthdays. Uneven (odd) number are considered lucky, therefore five (5) confetti are typically included in the bomboniera to represent health, wealth, fertility, happiness and longevity. More than five can be used if desired, always keeping to an uneven number. A bigliettino (little tag) or imprinted favor ribbon is attached with the date of the event along with names (as appropriate). Many people choose to offer confetti flowers as their bomboniere. Others choose a more traditional bomboniera made with some combination of tulle, organza, lace, silk, boxes, ribbon and flowers. Others choose to offer a more significant gift item, along with confetti. 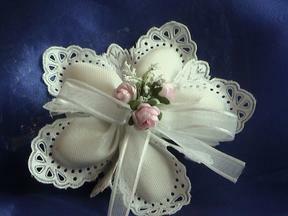 Traditional bomboniere (favors) are hand-made in Italy with silk, organza, tulle, ribbon and flowers. They can be filled with your choice of confetti – almonds, chocolates, or chocolate-covered almonds, and a beautiful bigliettino (little tag) from Italy is also attached in some way to the bomboniera. There are also many beautiful Italian paper boxes that can be filled with the confetti and wrapped in ribbon and flowers, with a bigliettino (little tag) for a simple and elegant favor. Confetti flowers – flowers made with tulle wrapped confetti as petals – are a more modern bomboniera following in the traditional but updated for more current tastes. The flowers come in hundreds of varieties and colors. In some families, a bomboniera(gift) of silver, crystal, or porcelain is also given as part of the tradition. Typical items include porcelain flowers from Capodimonte, silver bowls and crystal figurines. Each person gets a confetti bomboniera - a confetti flower or a bomboniera favor made with the confetti. We are pleased to offer the full range of bomboniera, from traditional Italian bomboniera, to Italian paper boxes filled with confetti, to confetti flowers, to items made in silver, crystal or porcelain.